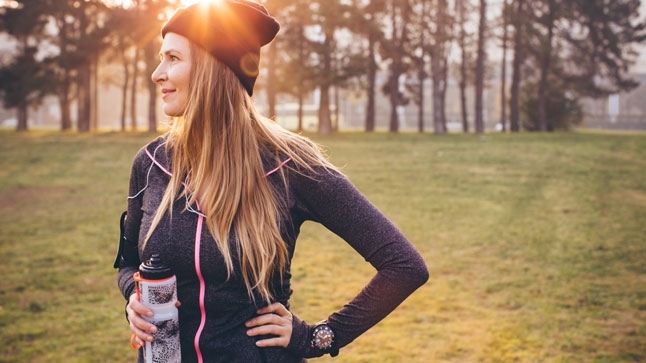 Whether you’re fulfilling a personal resolution to get more fit, or seeking to improve your existing exercise routine, don’t overlook the importance of hydration. Staying properly hydrated has many health benefits, and can actually improve your workout’s effectiveness. Water: What is it good for? Water is crucial for staying healthy. It helps maintain your body’s temperature, cushions joints, protects your spine, and helps rid your body of waste. If you’re not drinking enough during exercise, you can experience muscle fatigue, muscle cramps and loss of coordination that can impair your performance. Dehydration can also lead to heat exhaustion or heat stroke, which can be deadly. On average, adults need about 3 quarts of water a day. In addition to taking in water from beverages, you also absorb water from foods such as fruits, vegetables and soups. Three quarts is just a starting point. If you’re particularly active, especially in warm weather, you should plan to hydrate more. Most people plan to bring a water bottle along during a workout, but you’d also benefit from hydrating before and after you exert yourself. Before: Drink several glasses of water in the two to three hours before exercise, including an 8-ounce glass in the 30 minutes before you start your workout. During: Take a few big gulps every 10 to 20 minutes during your activity. After: Drink at least 8 ounces in the half-hour after you cool down, and more if you were working up a serious sweat or had a longer, more intense workout. Sports drinks are tempting, but for most people, plain old water is the best way to replenish. Replacing too much water with sugary sports drinks can inadvertently increase your daily calorie tally. That said, if you’re engaged in a high-intensity activity for 45 minutes or more, sports drinks can be a good choice. By providing fuel to your muscles and replacing electrolytes lost while sweating, sports drinks can help boost your endurance and improve your performance. Whether you choose water or sports drinks, staying hydrated will keep your body healthy and help you get the most out of every workout. Want to learn more about the water you drink every day? Take our drinking water quiz.